While musing over how we can entice Wayne Gretzky up to Churchill this fall, giving a little shout out to his number with 99 reasons seemed like a great idea. Now we know, trying to list 99 reasons is never fun. We do not recommend. Instead, let’s go over our list of 9 slightly silly reasons why the Great One himself should journey up to Manitoba’s stunning north. Wayne Gretzky will already be in town for the legendary Heritage Classic (October 23) so why not hop on a plane up north to see Manitoba’s once-in-a-lifetime experience? Did we mention it also happens to be peak polar bear viewing season? Wayne Gretzky is notoriously known as “The Great One” – but in the animal world, we think the polar bear has earned a similar title. The polar bear is an apex predator at the top of the arctic food chain – with the biggest polar bear on record weighing over 2000 lbs. Gretzky consistently anticipated where the puck was going to be and executed the right move at the right time – much like our outfitters in the north who know polar bear behavior and never approach or spook a tense bear. The outfitters in Churchill are known for their sustainable methods of waiting for bears to come to them. It’s only natural that a Canadian icon like Gretzky (who played for Team Canada 8 times) should come face-to-face with one of Canada’s signature icons: the polar bear. 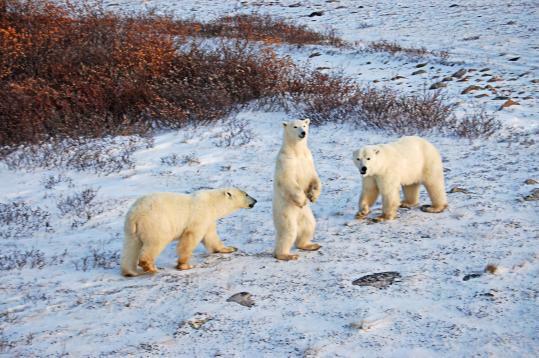 The polar bear has become so synonymous with Churchill that it has become known as the Polar Bear Capital of the World. Gretzky’s handling experience on the ice will come in handy, especially when trucking along the shores of the frozen Hudson Bay in search for polar bears on a tundra vehicle. The subarctic landscape of Churchill, Manitoba is the ultimate winter wonderland, with ice and snow drifts as far as the eye can see. It just so happens that Gretzky was known for having remarkable vision on the rink, able to complete a pass from anywhere on the ice. Churchill, Manitoba happens to hold quite a few world records, and so does Wayne Gretzky. Gretzky might be interested in comparing chops with this northern town to see which records come out on top – the worlds largest trilobite, or most points in a playoff series? Gretzky was known for having an unimpressive strength and stature, but it never stopped him from dominating the ice. It’s a good skill to have when you’re face-to-face with the world’s greatest predator and challenged with only one task: capturing the moment. Everyone has heard “You miss 100% of the shots you don’t take” at least once in their life. Wayne Gretzky would likely apply his famous quote from 1983 on a polar bear tour and always have an extra camera battery in tow to obtain the perfect photo. As a remarkable team player and coach, we imagined that Wayne Gretzky would take a keen interest in the team dynamic of dog sledding in Churchill and the role the musher plays in keeping the dogs motivated to race across open terrain. With each dog having a unique personality, Gretzky could share some pointers as a coach on how to combine different personalities to create an incredibly energetic team. So, have we convinced you Wayne? 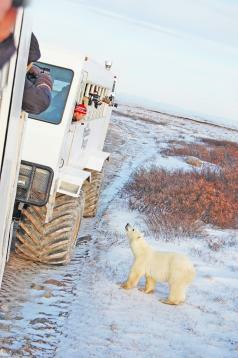 We’ll be waiting to greet you in Churchill, Manitoba!